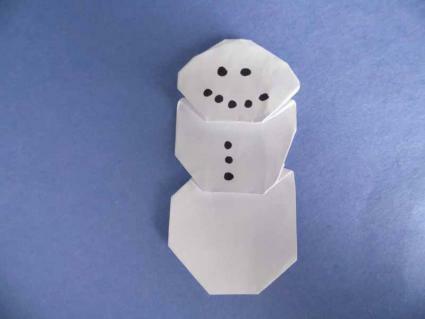 Bring a taste of winter right into your home by learning how to make an origami paper snowman. The art of folding paper is an ideal medium for home holiday decorations or simply to add a little nip of winter to a warm family room. A basic origami snowman is a beginner level project suitable for children as well as adults. 1. 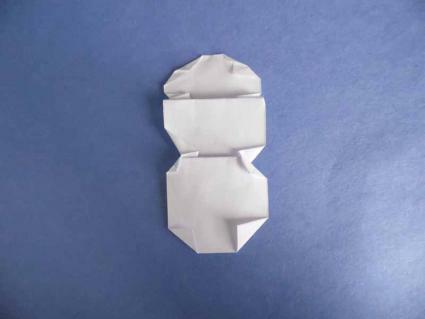 To make your paper snowman, you'll need a sheet of white origami paper or a square cut from copy paper. 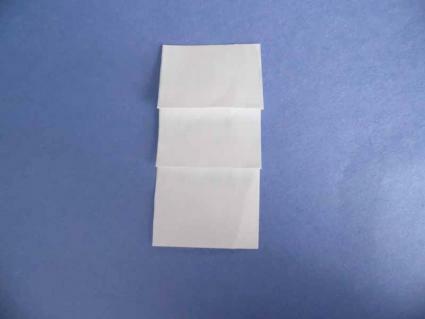 Fold the paper into thirds, then cut as needed to make three individual rectangles. You'll only need one rectangle to make your snowman. Set aside the other two rectangles for another day or make extra snowmen to share with your friends. 2. Pleat fold your paper rectangle into thirds. Pleat folds are alternating mountain and valley folds that are sometimes called accordion folds because the paper resembles the pleats in the popular musical instrument when you are done. 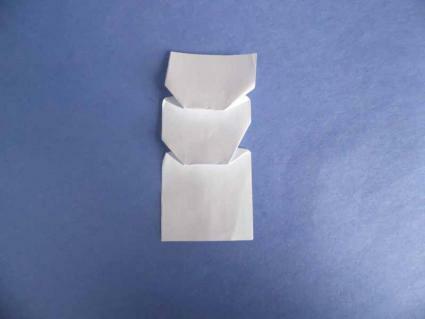 Make a mountain fold at the top of your rectangle, one-third of the way down the paper. Crease well, then make a valley fold where the mountain fold is indicated. Repeat this process on the other end of the rectangle. 3. Fold the corner of each pleat up to make a small triangle. Crease well, then unfold. 4. Use these folds to make inside reverse folds on the corner of each pleat. Inside reverse folds are done by slightly opening the paper, then pushing the guide fold so it lies inside the two layers of paper. 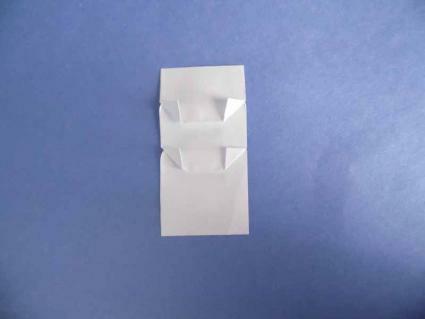 Most paper folders are familiar with inside reverse folds from learning how to fold a traditional origami crane. An origami crane uses inside reverse folds to make its neck, tail, and head. 5. Flip your paper over. Fold down the left and right corners of the top and bottom sections to shape your snowman. 6. Turn your paper back to the original position. Use markers or colored pencils to decorate as desired. 7. This design makes a lovely embellishment for a homemade Christmas card or scrapbook page. It could also be used as a Christmas ornament or a holiday gift tag. If folded from larger paper, it could be used as a holiday window decoration. Children who are making origami snowmen may wish to decorate the model using other craft materials. For example, the snowman could be given arms with a brown pipe cleaner or a hat cut from scraps of felt. Or, for a bit of sparkle, children could brush a thin layer of silver glitter glue over the folded snowman. Remember that the act of customizing their creations is part of what makes origami fun for children. This cute origami snowman design uses red and white paper to create a finished snowman that looks like he's wearing a Santa hat. If you're looking for a real challenge, consider making this beautiful 3D origami snowman from Campean Petru Razvan. This breathtaking centerpiece uses over 1,000 interlocking 3D origami units of various colors, so it's definitely a project you'll want to start well in advance of the holiday season. Do You Want to Fold a Snowman? Whether you live in an area that has warm temperatures year 'round or you'd simply prefer to stay nice and toasty indoors, folding a paper snowman is an excellent alternative to making Frosty from the real white stuff. Unlike a traditional snowman, your paper version can provide indefinite enjoyment.